In a city known for its high unemployment, two Windsor brothers became their own bosses when they opened up their own pizzeria. Jacob Dunn (left) and David Dunn became two of the youngest business owners in Windsor when they bought Riviera Pizza restaurant. In a city known for its high unemployment, two Windsor brothers became their own bosses when they opened their own pizzeria. David, 21, and Jacob Dunn, 17, sat around eating pizza one day when they came up with the idea to open their own business. From there, they hatched a plan and pooled their savings, which included money for birthdays and Christmas. "We just kind of checked the couch, everything we could," Jacob told CBC's Windsor Morning on Monday. All joking aside, though, the brothers worked closely with their parents and eventually found the well-established Riviera Pizza restaurant up for sale. To set the brothers up for success and to teach them the business, the previous owners brought David and Jacob in and put them to work for two months. "We needed ... that mom-and-pop-shop type feeling and so they taught it to us and we couldn't have been more lucky," David said. Jacob, who still attends classes at F. J. Brennan Catholic High School, spends four or five days a week at the restaurant. As soon as he's done school, he heads to the restaurant. On slow nights, he can do his homework while at work. David, who spends about 70 hours a week at the restaurant, says he and his brother are not shy to try new recipes and neither of them has any trouble dividing up the work. "It's almost easier than expected," David said. "If I don't know how to do something, Jacob will figure it out. If he doesn't know how to do something, I have his back." 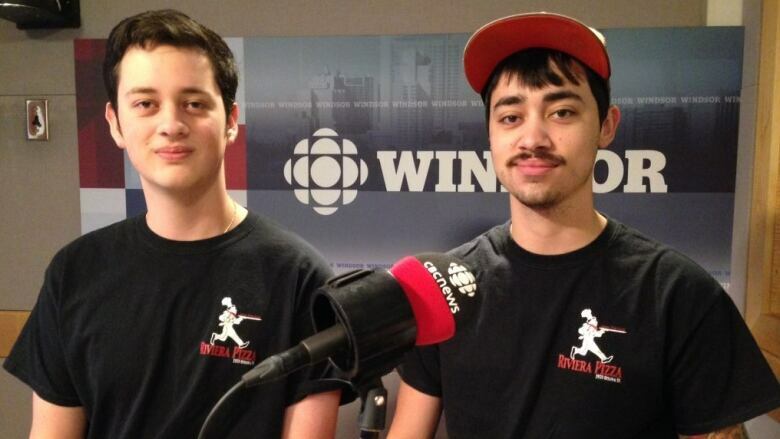 Recognizing the already saturated pizza market in Windsor, the brothers knew they had a challenge ahead of them, but they've managed to find a way to stand out by specializing in vegan and gluten-free pizza. "We're one of the only places that does make our own," David said. "The dough's just different, it's harder to work with, so I think a lot of people just stay away from it." The brothers have four employees, but family members and friends, including mom and dad, are regularly at the restaurant helping out.